Discover the hidden corners of Hong and Panak Islands on a full-day private tour from Phuket. Complimentary hotel pickup and drop-off gets you to the pier and back comfortably and punctually. 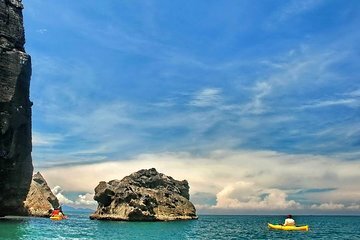 Once aboard your private longtail boat, head to the islands and let the kayaking fun begin. You can paddle solo or with a guide. The well-rounded excursion also includes sightseeing on Hong Lagoon and a filling Thai lunch on Koh Yao Yi.